When will SOB I, WTS, etc, get to Hi-D CD? Note: Trash your Cache or hit Reload, to be sure you're getting the latest page versions. With the release on ESD of the full Carlos music to Kubrick's A Clockwork Orange, "Timesteps" became available at last in new 20-bit Hi-D digital sound. Long-awaited by fans (many, many earnest requests were sent to our site, in fact), this well known example of sophisticated Moog Synthesizer composition from the early 70's was available in miniscore for several years upon the release of the film. It went out-of-print eventually, and with that the composer's manuscript became difficult or impossible to locate copies of. About twelve years ago a petition was being passed around during a summer music conference that protested what then seemed both inevitable and awful. Record manufacturers were lobbying for placing a chip in every CD player that would detect a steep notch at about 2.5 kHz in CDs, If such were found, the equipment would prevent digital copies or clones from being made. Hmm... wouldn't such a steep notch, right in the middle of where the human ear is most sensitive, not be kinda obvious, I mean, wouldn't this be a crummy thing to do to all music recordings from now on? I tried out the steep filtering in my own studio. Soon I found that others had assembled even better demos, "before and after" of the actual notch-filter on many examples of music. Listening time ensued. Results? Just off the top, you weren't always aware of the notch, especially in somewhat distorted, raucous selections. But on well recorded live masters, something as straightforward as a solo piano, the damage was plain enough. I could hear it right away. On piano and many synth sounds the notch was steep enough that a few med-high pitches were almost completely removed! After notching, it sounded just as if the pianist had stumbled, and not hit all notes equally hard (can you believe it?!) There were other similar gaps (LITERALLY!) in other recordings, and I could produce the same disturbing problems with my own music here. Yikes! A first-class IDIOTIC idea, fer sure! Depressingly, I discovered later that no other modestly well known musician had signed the protest. Nope. My much more famous "colleagues" were either asleep at the wheel as they were about to crash, or just didn't care, as long as the new scheme brought more royalties for them. It felt rather awkward to be alone among the majority signers, a new niche of "keep it sample, stupid" producers, who simply wished to be able to stea... oops, "borrow" passages from someone else's CDs to use in their own productions (a practice that some of us still have honest reservations about.) Their motive was clearly self-serving. All I'd hoped was others would altruistically protect the quality of music recordings, even if it might hurt them a little in the wallet. I was disappointed in my fellow musicians. Also in this lousy "protection scheme". I tend to be very skeptical, and when in doubt, like that earlier Summer, I ignore the "latest miracle". That I've decided finally to go ahead with MusiCode comes about only after a long careful testing. Last year I learned that a Brit rock group had stolen about a minute of my music from "Well-Tempered Synth." The lift is obvious, including the wow of the original CBS-LPs (no CDs of WTS exist yet -- it's only now in the works for midyear)... wot unbelievable cheek! It feels exactly like arriving at home and finding you've been burgled while you were out to the movies -- not too pleasurable. It would be wonderful if all my music contained hidden signatures, signatures that could not be removed without screwing up the music. MusiCode survives severe MPEG audio compression, cassettes duping, radio transmission reception, and even picking up over a microphone sounds coming from a cheap speak, to say nothing of the various audio manipulations that the average DAW provides. Watermarking will help BMI, ASCAP, etc., learn when your music is used on the air, even a snippet. Some of mine has been stolen for commercials several times in the last ten years. Are folks just getting cheekier, or is dishonesty becoming fashionable? No matter, if no one can hear the watermark, but it's easily decoded with a modest auditioning device, I think the industry ought give it a nod. I hope the Aris company's new MusiCode will become the standard, and have nothing to gain in writing this to you, except to spread a helpful bit of information. For months last year I'd followed up with tests begun in 1997, trying to prove I was able to detect MusiCode by ear. Aris kindly made me special custom CD-Rs containing many selected excerpts of my music and all other kinds, with the same "before and after" comparisons. Sorry, but I failed. And so will you. Even when the level of their coding is pushed a hundred times the usual level, it remains amazingly subtle, dammit. Our conversations were amusing: "Still can't hear it. Didn't you say you'd boost it until I could detect the differences?!" "Ah, yes we did boost it a lot; it's now WAY louder than you'd ever use on a master!" "Well, please humor me, and boost it even some more." "Fine -- a new CD's on its way with another ten times more than the last batch. Let us know what you hear." That's how I got to hear super exaggerated examples, until they warned me the coding was reaching the limit of what they could generate, but still so damn subtle. How is it possible? Remember that the data is short and move very very slowly, only a couple of bytes per second. That means very little information is added, compared to the music. The system is psycho acoustically designed, like Dolby SR, or the high compression of Dolby Digital, with barely audible artifacts. In Aris's case, they reduce coding when it might be subtlely audible, then bring it up only when the music will hide more. It adapts to the music, fits each selection like a glove, not the other way around. I just could not train myself to pick up the teensiest traces of MusiCode -- I still can't find it on my music, or tell when it's there or not. (Wouldn't it be cute if there actually IS no MusiCode, and they're just having me on...? ;-]) But I saw their little boxes pick up the messages, as it averages over time and figures out those nearly invisible clues to the slim data stream. Now you know how it is that my lovingly slaved-over masters and remasters come to include MusiCode in them. I DARE any of you to detect a thing. A data base is now being assembled, in ISRC codes. Soon it will be unlikely a broadcast of any music can be played for commercial profit without the artists getting their tiny share, and a credit for their labors. I don't see how any reasonable person could object to this, and suspect that this is another one of those ideas whose time has come. PostScript! Many of you by now have learned the good news: Aris MusiCode (with one other alternative in certain cases) has been accepted as THE watermarking standard for all DVD audio disks. And under the new company name, Verance, it's also being used throughout the industry, in broadcasting, web audio, tracking for BMI, ASCAP and other major lisencing agencies. For the British version of By Request, CBS 73163, "Pomp & Circumstance", a parody of the Elgar chestnut, was removed, since this had been CENSORED in England! At least that was the story CBS told us at the time. Several years ago on a trip I found a copy of the Brit version in the big London HMV store. The rumors were true -- quite unbelievable! A few selections from The Well Tempered Synthesizer had been substituted in place of our good-natured, if "over-the-top" parody. When Rachel and I first were told about the mini-debacle, I slyly suggested that we put a sticker on the USA version reading: "Banned In Britain! ", if this were indeed the case. Of course CBS refused. On the upcoming ESD Hi-D remastering we won't be so timid, (heh, heh, heh...) so finally you'll get the whole story. While it was very deeply satisfying to have the chance to go back over this pioneering album, when I produced the 20th Anniversary edition for Telarc (Switched-On Bach 2000), there remains a charm to the original versions, inexact tunings and several finger-slips notwithstanding. It also has its historical function, and no new revisiting on the old chestnut can take that away or ever replace it. You will see above that there were two versions put out on CD by CBS/Sony during the 80's and early 90's. The first one was a completely normal transfer, while the second was more deluxe, in packaging, in its use of an early form of 20-bit encoding (SBM = Super Bit Map, as CBS called the innovation, supervised by the true digital expert and friend, David Smith), and in the price, which was only to be expected. When all of my albums reverted back to me in 1997-98, both of these CDs were discontinued. Some warehouse and store stock still existed for quite some time. That was fine by the terms of the contract. But no new pressings were allowed -- I was going to get control over my music at long last! Huzzah! And as you'll also read above, the original SOB will in fact be coming out on ESD in 1999 (Note: this happend right on schedule -- see the informative page about our new Switched-On Boxed Set!). The news is even better than than, though. It will be coming out in the new 20-bit Hi-D sound, supervised by me, and will be taken from the very first pre-master mixes of the multitrack (as I explain below, no remixes are allowed this time.) In a very non-straightforward process (the only way possible), I am now working on reproducing in my DAW the final master from sources two or more generations earlier than any before available on LP, Cassette, or CD. Tricky business, but well worth it. The quality on this new SOB CD will be much better than anything you have yet heard. No kidding (ed: so it was written; so it was done!). Eventually (perhaps soon, now that the standards seem to be in place) surround sound on DVD will be a popular medium for home music delivery. The good news is that the third and fourth disks of the Bach collection (S-OB II and the Brandys) are now preserved in superb 20-bit surround master transfers, from which the ultra-stereo two track CD versions on the new boxed set were made. So those will lend themselves neatly to 5.1 or whatever versions quite nicely. Switched-On Bach I was mastered in two track stereo, but a couple of years later got the early quad treatment, too. We made careful new mixes at CBS's bequest. But that mastering was released in their phony-quad system: SQ, if only for a couple of years in the early '70's. We will evaluate if that mix lives up to our usual standards, and also how greatly it may differ from the original we're all used to. The Well-Tempered Synthesizer was never mastered to anything but two channels. Evenso, we have the original multitrack tapes, so it might be reasonable to do new surround mixes, which would allow ALL the Switched-On Boxed Set music to become surround-ready, if you'd permit the fact that the first two will not be exactly the same in balances on every line and part to the originals (this is why the Boxed Set has been made available first as the best possible version of the original masters, for historical reasons. Other versions can then follow, as interest demands). Perhaps it would be best to test the reactions to the selections which would not need such revisionist history as surround remixing. Stay tuned for news on those after all the stereo titles have been completed. The optimum 20-bit masters first became a part of the Switched-On Boxed Set, equivalent to a "director's cut" LaserDisk, with many additional bits not seen or heard before. Included in this boxed set is the very long requested (but not as much as the first two re-releases, SS and CO), The Well-Tempered Synthesizer. Indeed, indeed! I'm rather thrilled by this, myself, as it has remained my favorite of the Baroque things I did, in many ways. No need to chill out any longer (which is what this page has been saying for a couple of years -- thank you for your patience, good people). You can get the collection, or the individual titles. All four unbundled Bach and Baroque albums are now available on ESD. These are DEFINITIVE editions, no hype, no nonsense, and took a long time and a great deal of TLC to prepare. As I get older it seems everything takes longer than ever before. But they do get done, and the quality is still the best we can make it. We're near the end of the list of back albums finally, and they all will be available. And that, dear WebSurfer, is all I can tell you at the moment. Wish us luck, as there's a lot of work remaining, and hold on. I like to shout at such moments: "Don't worry -- it'll happen!" (Top of Disc Notes) which continue below. "The Moog synthesizer was the first electronic performance synthesizer widely known and recognized by the public and the media. 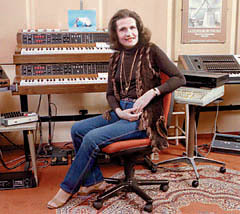 Wendy Carlos is the original Moog synth performer and composer whose early albums were responsible for this recognition, and for the modern concept and highest standards of synthesized music." In answer to several recent questions about the new remasterings on East Side Digital, please understand that they are all taken from the original mixed master recordings. Small overall adjustments of level and EQ were made very discretely (mostly to compensate for better monitoring now, and desired adjustments that couldn't be made back then very easily.) Minor repairs were made to ticks, thumps, hisses and hums and the like, that were NOT a part of the music nor our intent. I was just trying to squeeze the maximum out of those old tapes. Not a single case of remixing was performed. The master tapes from the first mix stage were located, gently gotten to play smoothly, and became all the source material. The multitracks were NOT touched in any way. All the originally performed mixing (good mixing always seems to me to be a performance) was done back that day when the multitracks were completed, and their contents were familiar territory. To try to do this again so many years, decades, later, would result in a new interpretation of the work, perhaps better, but in other ways worse, certainly different. If you hear actual differences, some due to a few gentle EQ tweaks, be happy that the distortions and forced squashing of the master needed to fit onto an LP have been removed. Isn't that wonderful?! The many compromises that were found necessary to keep the cutter from distorting, the stylus from jumping a groove, or the final LP from being unplayable, are all gone (removing maskings and that prior "veiled" quality you may note is missing.) The new CDs sound here essentially like the Dolby master tapes (those were a LOT better than CBS was able to put into vinyl or cassette!) We may try to release modern versions, new remixes, of some of these performances eventually. But if and when we do so, we will say so clearly on the package, that these are reinterpretations of the original multitrack masters. Fair enough? For a lotta years I was trying to refine my LSI Philharmonic Orchestra voices and sounds (first heard on Digital Moonscapes), so that rich traditional timbres might also be fair game for a medium that promises: "any sound or timbre you can imagine." To a strict sense, that may never hold true -- no matter how far we come, there will always be areas worthy of improvement, even if only in subtle, minor ways. But over the last two decades notable progress was made. By the late 80's I was pretty happy with the ability to recreate the spirit and replicate the essential timbre of most woodwinds, several brass, and large chunks of keyboard and mallet instruments. The percussion battery came a little earlier; but strings definitely came much later. I still love many of the replica voices I synthesized tediously over years for the GDS and Synergy synthesizers. In a few cases, when compared to the finest sample-based programs, they may not be quite as real for single notes. But they "play" and "interact" as melodic or harmonic elements much more in the flavor of an actual acoustic instrument. While I was moderately successful on duplicating the essence of a section of lower pitched strings, 'celli and viole in ensemble, the upper ranges of all, especially the violin, mostly eluded the most intense efforts. The splendid, effectively "state of the art" synthesizer, the Kurzweil Young/Chang K2000 and K2500 family (currently the K2600 and K2661), helped me more than I can say in gaining some of the added "reality" of waveforms derived from actual samples of the desired instrument, but while retaining all the essential expressivity and variations that only a true synthesizer could provide. (Note: for something new which uses them, see the new instrument setup, HERE.) It certainly changed my mind, when up until then I thought that sampling was pretty "slim pickens." Over the last several years I transferred much of the data that I had collected on the Synergies into their flexible synth environment appropriately called: "Vast" (I've praised the K2000/2500/2600 in the past, and will eventually post on this site a few interviews in which I discuss more details.) In so doing I learned a lot more, and got a lot closer to including real orchestral timbres in my arsenal. In the non-orchestral category the gains were even greater. But the string section remained a sore, nuisance point. That finally changed when I was generously given first the ProSonus library of Strings that Scott Levitin so able produced, and then Ken Hiskey's lovely reworkings and extendings of the Synclavier Strings for his excellent Ilio Entertainment company (Ken's also a neat person.) They are very different, but both are beautifully done. Initially I thought very little would come of this: someone's "canned" samples? Gotta be kidding. Was I wrong! Snap judgments and prejudice are no way to form an opinion... It took me quite several months to corral this rich but sprawling assortment of material, and assemble it into versions I needed in making music the way I do. Again, I learned a lot in that effort, building flexible, wirey voice program families that were highly expressive, yet very real sounding. From Feb through June of 1998 I used all three string families within my score to Woundings. Ken also stepped forward and sent me some excellent optimized orchestral percussion, with his own good additions. You'll hear these when we put out our pending collected Film Music CD at the end of this year. For Woundings, an anti-war movie, I needed military drums, snare ruffs and flourishes, additional coloristic cymbals, some Latin exotica, and other realistic material to add to the percussion battery I'd been live-sampling and building for a few years. It's a lot easier to incorporate percussion sounds into Vast than strings, but that came as no surprise. I'll use them all again, and newer variations and additions on the next new project, just begun, but to await completion of the ESD rerelease commitment first. I'll keep you all informed as things continue.